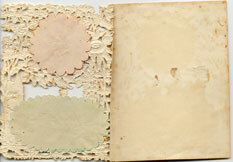 One of our Museums rarest and most prized possession is this Esther Howland Paper Lace Valentine. A true rarity, very few of Howland's early Valentines are in existence today. You can read about Esther Howland in the History Section of the Museum. This delicate card measures 2 3/4 by 3 3/4. Our enlargement is larger so you can get a detailed look at the intricate work. This card is blank inside. Howland's cards were stamped on the back with her trademark red "H". 3-D Pop-Up, Fold-Out, Cut-Out Card. Front piece says "To my Valentine" and folds forward, stands on its own to reveal the 3-D effect and says "To My Valentine, May every good my dear one bless life virtue health and happiness"
3-D Pop-Up, Fold-Out, Cut-Out card. Front piece says "To my Valentine" and folds forward, stands on its own to show the 3-D effect and reveals the two children sitting on a dock fishing. Embossed, Gold Foiled Postcard reads: "Anticipation - Passed her by, Heaved a sigh, Made a bow, Love her now. Sweet Valentine"
Mechanical Embossed Cut-Out Card gives the appearance of the little Dutch girl running when the wheel of wooden shoes is spun. The wheel of feet is attached by a small metal grommet. The heart in her pocket reads: "To My Valentine"
Small Embossed Cut-Out Card reads: "Valentine Greetings"